Branko Crvenkovski was born on October 12th, 1962 in Sarajevo, Bosnia and Herzegovina, where his father was serving in the Yugoslav National Army (JNA). Branko Crvenkovski graduated from the School of Electrical Engineering from the University of St. Cyril and Methodius - B.S. in Computer Science and Automation in Skopje, 1986. He is married and has two children. After the fall of the first Macedonian government of Ljubco Georgievski in 1992, Branko Crvenkovski, was nominated by the President of Macedonia, Kiro Gligorov, for a mandatory to constitute the first Government of the independent Republic of Macedonia. Branko Crvenkovski was prime-minister until 1998, when his place was taken by Ljubco Georgievski. In the parliamentary elections held in 2002, his coalition of 10 political parties, Together For Macedonia, was re-elected and was given another mandatory to form a government where he became a Prime Minister again. 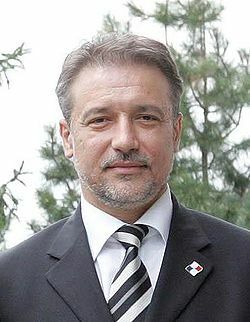 On the presidential elections in April 28th 2004, in the second round Branko Crvenkovski was elected as a President of the Republic of Macedonia.